Theories about Atlantis mention the extensive use of crystals by Atlanteans. Crystals varied in slight, color, and harmonic frequencies. Crystals follow harmonic frequencies and could be used with an instrument that looks like a tuning fork. Atlanteans allegedly harnessed the energies of the pyramids, using harmonics linked to crystals to that end. As we have the Great Pyramid at the center of the planet linked to the grid matrix that creates our reality, so, too, did the Atlanteans. Their pyramid allegedly sunk to the bottom of the Atlantic Ocean which is a metaphor about returning to the collective unconsciousness or source of creation. Reality is a Consciousness Hologram. Atlantean Seed Crystals were allegedly flawless and grown as we grow flowers today. Atlantean crystals received power from a variety of sources, including the Sun, the Earth's energy field grid system or from each other. Grids point are often marked by pyramids. The Atlanteans used this energy, combined with crystals, to transmit energy from one pyramid to another or, as aliens, to enter and leave the planet. Depending on the tilt of the Earth's axis at a particular time of the year, one pyramid would function to intensify and transmit energies to other pyramids which would then act as receiving devices and would disperse energy as it was needed. The opposite would apply when that pyramid was at an unfocused point to their celestial alignment, when other pyramids would be used as transmitters. It was an intricate matrix crystal grid system. - Communication - Crystals have the ability to transfer energy, to retain it, to maintain its intensity, to focus and transmit it over great distance to similar receivers as are equal or comparable to the transmitter. The larger stones, called Fire Crystals, were the central receiving and broadcasting stations, while others acted as receivers for individual cities, buildings, vehicles and homes. On a higher spiritual level, rooms made of crystals were places where the Initiates left their bodies in the Final Transcendence, often never to return. One of the most detailed descriptions of the Atlantean use of a mysterious instrument called the Great Crystal was given by Edgar Cayce, who mentioned it many times. 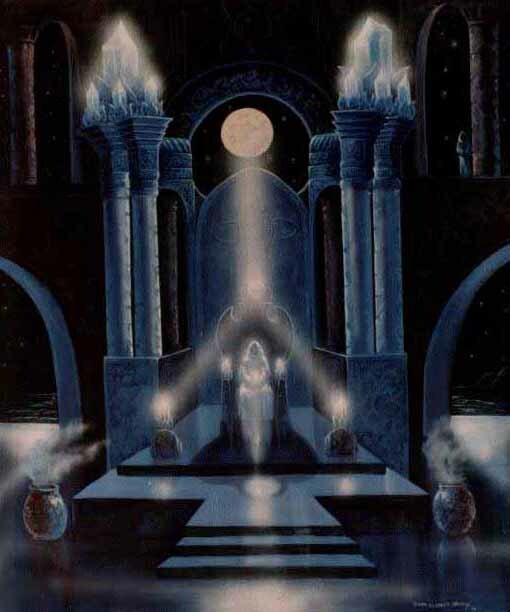 The crystal, he said was housed in a special building oval in shape, with a dome that could be rolled back, exposing the Crystal to the light of the sun, moon and stars at the most favorable time. The interior of the building was lined with non-conducting metal or stone, similar to asbestos or bakelite, a thermosetting plastic. The Crystal itself, the Tuaoi Stone, or Firestone, was huge in size, cylindrical in length, and prismatic in shape, cut with six sides. 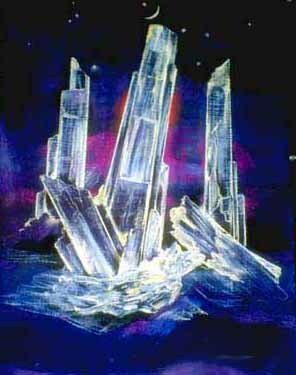 Atop the crystal was a moveable capstone, used to both concentrate incoming rays of energy, and to direct currents to various parts of the Atlantean countryside. It appears that the Crystal gathered solar, lunar, stellar, atmospheric and Earth energies as well as unknown elemental forces and concentrated these at a specific point, located between the top of the Crystal and the bottom of the capstone. Later the Great Crystal was put to other uses. Currents of energy were transmitted throughout the land, like radio waves, and powered by these, crafts and vehicles traversed the land, through the sky and under the sea at the speed of sound. By utilization of other currents originating from the Great Crystal, the Atlanteans were also able to transmit over great distances the human voice, and pictures, like modern television. In the same manner, even heat and light could be directed to specific buildings or open arenas, giving illumination and warmth by seemingly invisible means. In this timeline, in the Bermuda Triangle, on the ocean bottom where the ruins of Atlantis now exist, the energy build-up in the sunken and damaged Fire Crystals can periodically trigger materialization of anything. our genetic encoded crystalline make-up. This crystal links with the fibonacci spiral -the spiraling energies of creation based on the patterns of Sacred Geometry. Consciousness spirals as if from the top of a pyramid - down to third dimension. The lower you spiral - the slower the energies move - until you can no longer remember what exists above and the nature of who you are as your consciousness becomes Frozen in Time - Ice Age metaphor - Crystals and Ice. 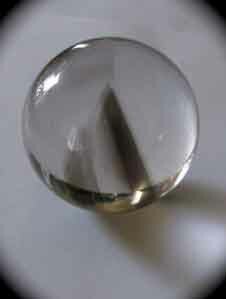 This crystal contains 6 sides and 6 facets on the top. As the story goes ... the people of Atlantis had many warnings before the continent sank (the Atlantean program ending). Prior to closure, crystals were allegedly used to store information which would be found in our timeline by those who programmed them. These crystals contained the original star codes for the Atlantean program. Once found, the crystals would be used as a means of helping them remember. But if all is happening in the NOW, than we are in a parallel situation, though Atlantis seems like thousands of years ago. Our souls are experiencing in both grid programs simultaneously and the crystals are our spiraling DNA moving consciousness between realities to experience and learn.